What Is It, Who Made it? 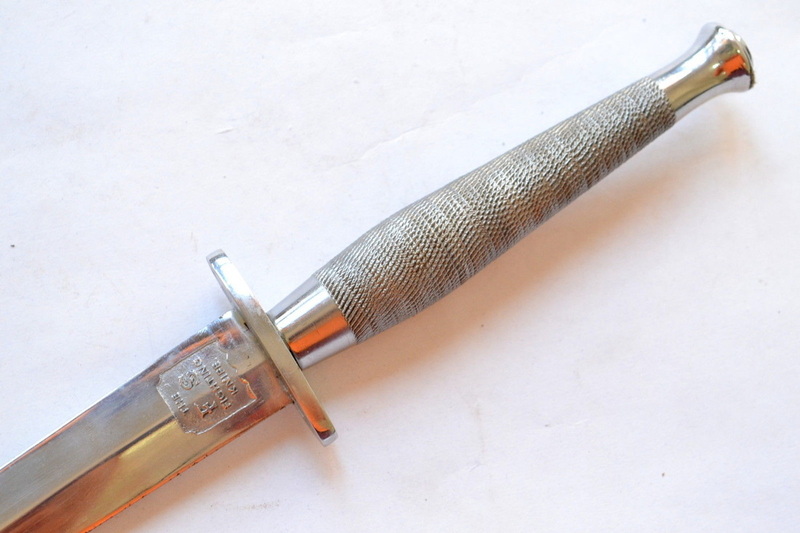 This page is devoted to listing knives without any, or marginal, provenance in the hopes that visitors will be able to provide information to help identify them. These items are ours and others. So please share your knowledge and help identify these knives by contacting us through the message link on the above contact page. If you have a knife you need help with please send good quality digital photos (jpeg), any background information that you have, and your permission. Use the contact page to get in touch with us and we will respond with an email for you to contact us directly. Does anyone know who made this knife or where it might have come from? Solid brass handle and guard, a triangular blade (made from a file?) Pointed skull crusher top nut. No markings anywhere. The sheath was clearly made for this unusual knife. The workmanship is very good on knife and sheath. If you know who was responsible for making or faking the French Nail Head with these stamps please email me. It has been in the owners possession since the 1970s. Below: I am looking for any information connected with this etch as found on some older J. Nowill & Sons knives. For example was it added to commemorate a special event or date, or does it have some historical significance? Your help is appreciated as always. 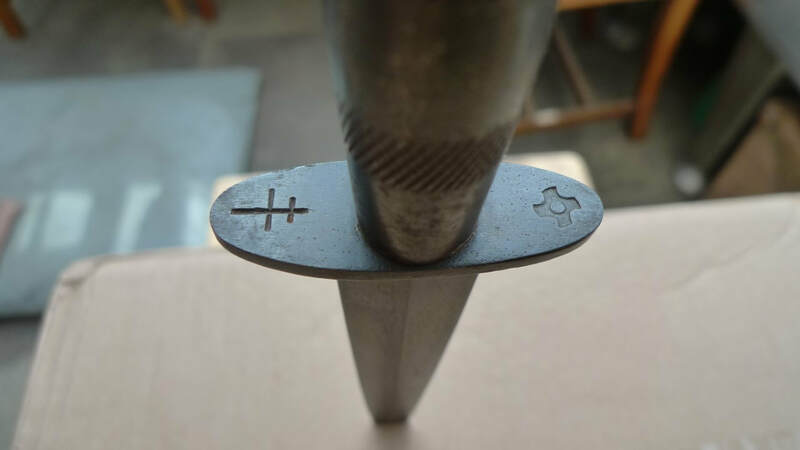 Below: Looking for possible maker of the blade shown. It is about 1/2 the width of traditional F-S blade but as thick as one. The tang fits a standard 3rd pattern guard. 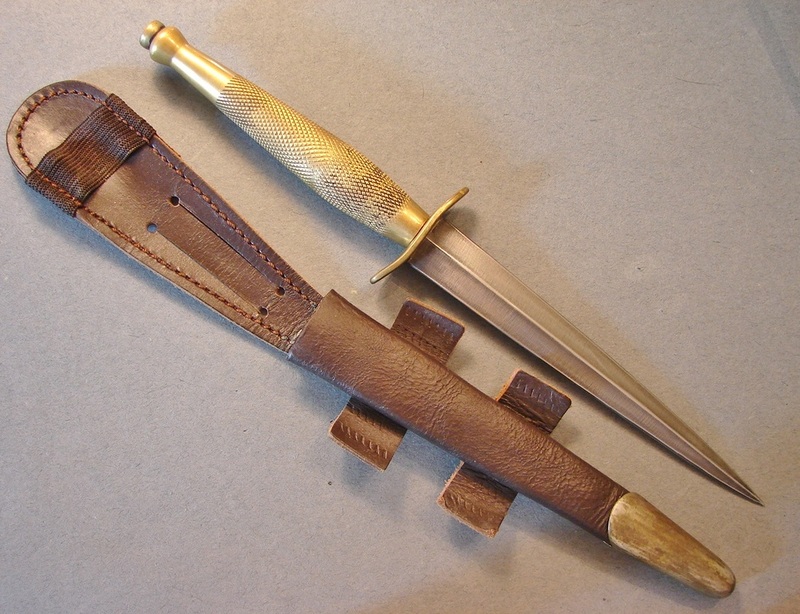 The story I got is that it was a prototype Fairbairn blade and a gift from a Filipino policeman to a US soldier. I am wondering if the story has gotten mixed up and it was a Shanghai policeman. 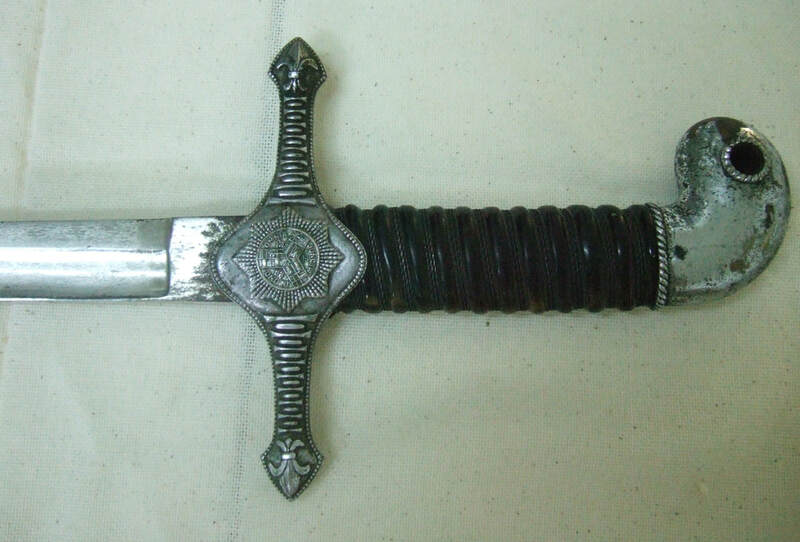 A gentleman contacted me looking for any information on the sword pictured here. It is identical to the one seen in photos of W.E. Fairbairn in his dress uniform. If anyone has any information on where W.E.F's sword is would you please contact me. Perhaps you have seen Fairbairn's sword in a museum, private collection, or a book somewhere. Drop us an email. 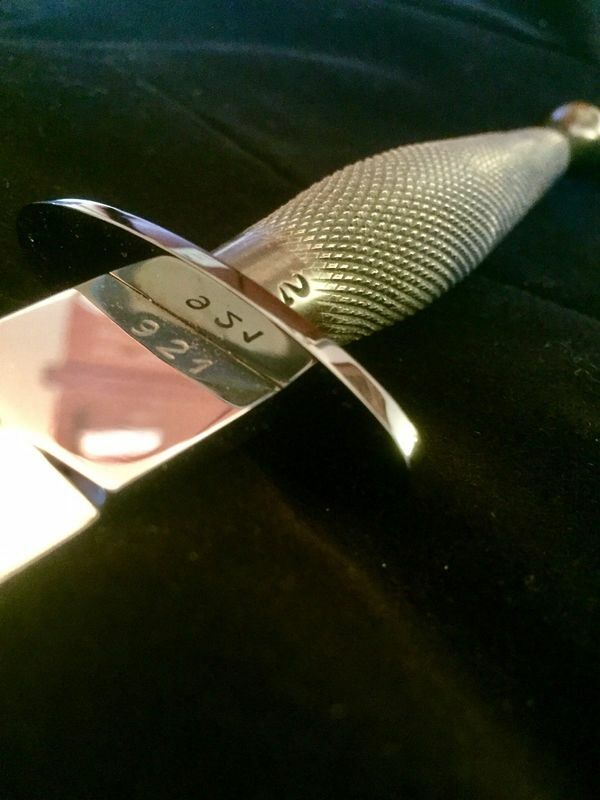 Update: It appears the sword is Wilkinson made with a cartouche stamped in the blade. We also know Dorothea Fairbairn sold her father's sword to the "junk man". The question remains, where did it go after she sold it? 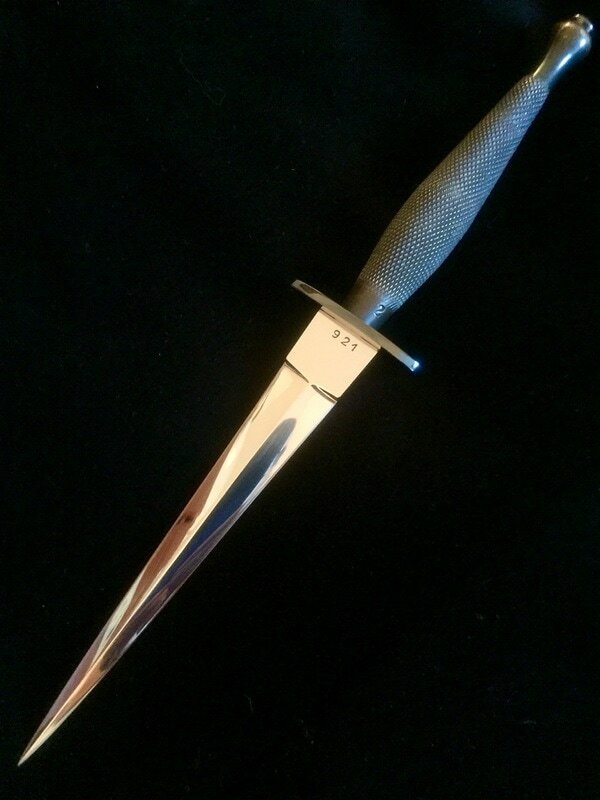 Below: I have no idea who made this very fine X-dagger style knife. Anybody know who made it? email me at ghdave2@hotmail.com The knife came to me from Paris France and is of the highest craftsmanship. Below: Here is the latest odd-ball knife. 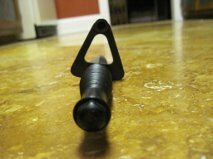 It looks as though it is made to adapt to a firearm. Some have suggested perhaps an MP-5 or an H&K. Some have proposed it might be a special way to mount to a plaque. I have contacted J. Nowill & Sons and I am waiting for a response since it is one of their knives. I am open to suggestions. The owner said they have seen one other identical to it. Representatives from J. Nowill replied that they do not know what it is. That seems odd since they made the knife, but that was their reply. Below: We have another new addition to our who made it page. 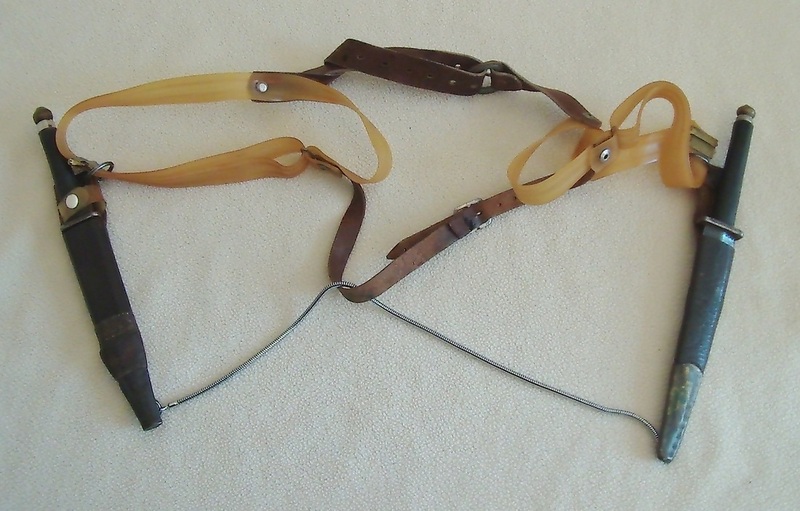 It is a very unique pair of daggers with a modified pistol shoulder rig. The owner Andrew Allkins from the UK said it belonged to his grandfather who was in WW-II. His grandmother only mentioned that it was carried by her husband on missions. Unfortunately both have passed away and the stories remain untold. Neither of the knives are marked in anyway. If you have any idea on the maker please contact us through the place on the reference page. My guess is maybe India? UPDATE: Well new information from the Grandson says that his grandfather was named Peter Cox. Also of interest it seems as though he served in the marines and also in SOE in the China-Burma-India theater. That makes my guess of India as the source of manufacture even more plausible. Below: Here is another knife I have had for a long time and have no idea who made it or when. It is obviously post-war. It is very good quality and the blade looks like another knife I have seen but I cannot figure out which one. The blade is nearly hollow ground and was blued at one time, I think. The brass handle is very light colored brass like maybe high in tin content. It has nice bold checkering and an "S" curved guard. The sheath is constructed of high grade leather with a pebbled texture. The chape resembles those found on Fatman sheaths. All in all it is a really nice combination. If you know who made this knife please contact us through the links page. Very Well Made Dagger, By Whom? UPDATE: I believe I have now satisfactorily determined the country of origin to be India. I am still working on finding out the manufacturer/s name. It turns out that there are many manufacturers in Indoa still making these type of knives. Fake or Not, Who Made It? 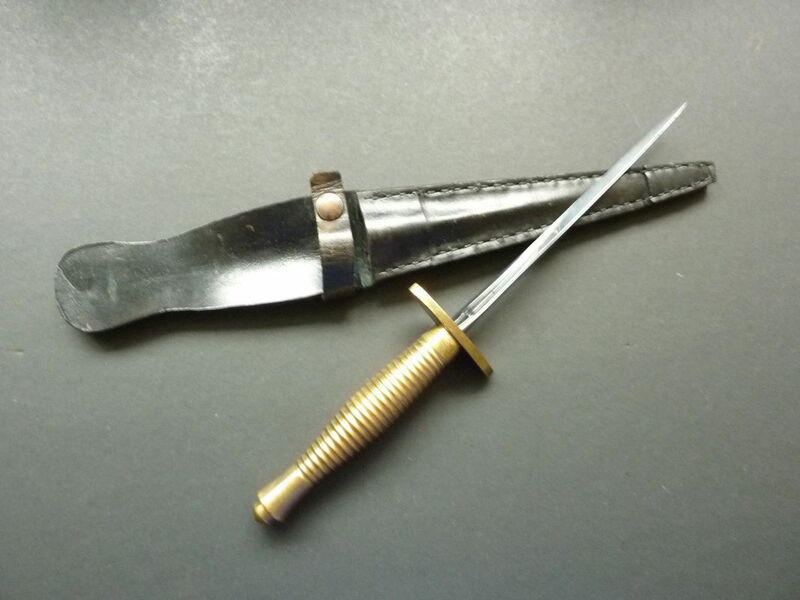 Spike Bayonet Blade: Whether this is a one-off or even WW-II vintage (or not) is hard to tell. 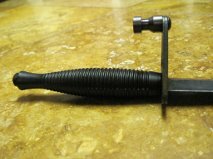 The blade is taken from a British MK-II bayonet blade. The knife has a diamond shaped steel cross guard. The handle is expertly lathe-turned of solid brass in a (non-ringed) Third Pattern shape. It is all held together by an acorn top nut. The entire unit is professionally made and it makes for a very interesting variation. 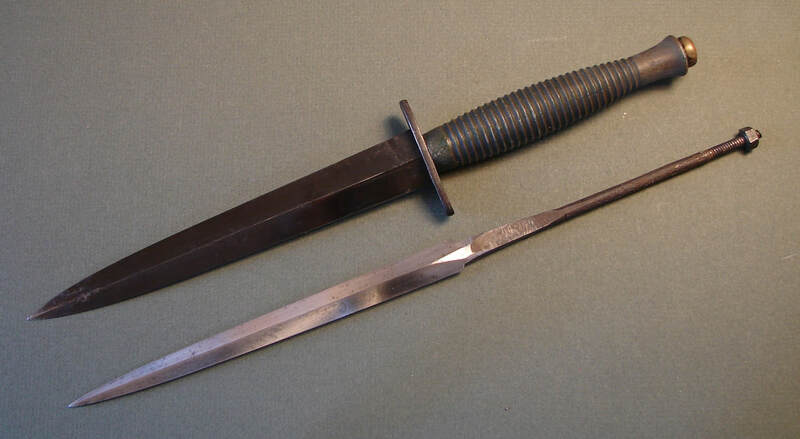 Quite often weapons like this are referred to as "Theater Made" or sometimes "Home Guard" knives. Its only function (like the bayonet from which it was made) is to punch holes in an enemy as it's round "blade" will not cut at all. 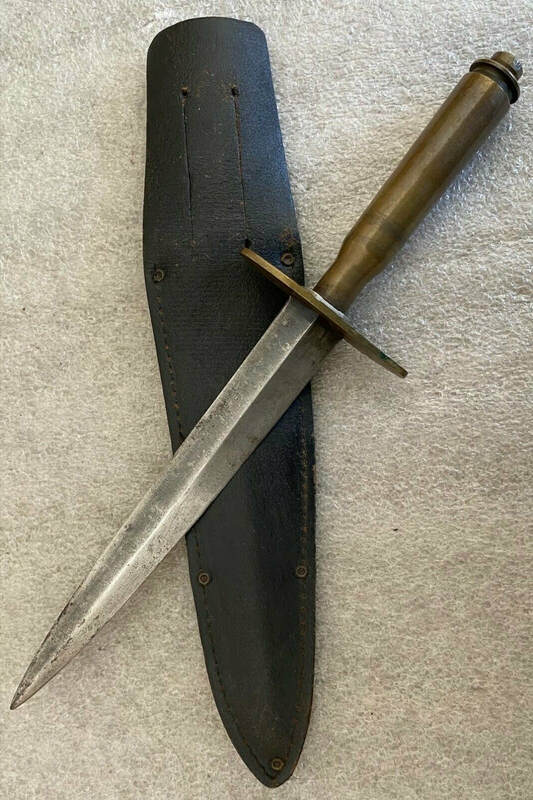 New information from a friend in England indicates this knife could be a fake from post WW-II. This does not surprise me as you can tell by the first sentence in my description. 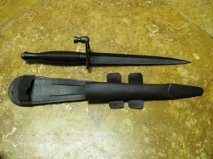 He says the blade is not from a MK-II bayonet because it lacks the flats at the tip. It fits the sheath perfectly.